When Christian Pulisic has had a chance to catch his breath and look back on the 2016/17 season with Borussia Dortmund, he will no doubt reflect on several defining moments. Perhaps no memory will be cherished more fondly than the DFB Cup final against Eintracht Frankfurt in Berlin, however. The young American, who seems to carry the hopes and dreams of the free world on his shoulders whenever he steps onto the field, played an influential role in the 2-1 victory against the Eagles, a triumph that brought BVB a first major trophy since 2012 and an end to three successive seasons of heartbreak in the Olympiastadion. 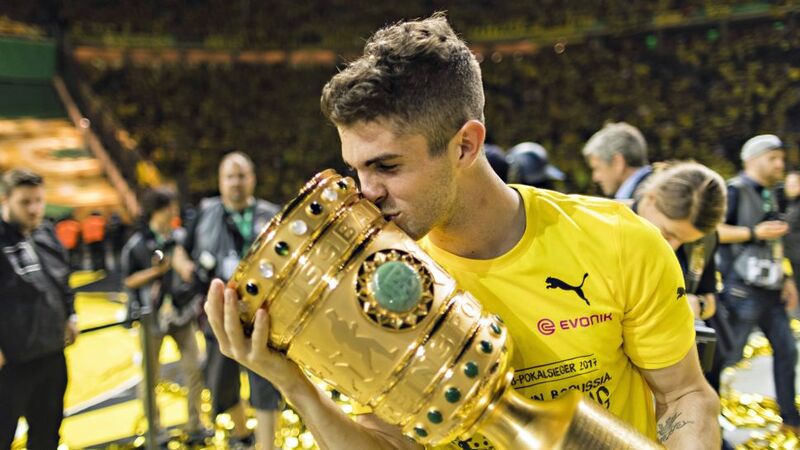 It was perhaps fitting that Pulisic, symbolic of the new BVB generation, was at the heart of the long-awaited triumph. Latching onto a dinked through-ball from Raphael Guerreiro in the 67th minute, the American - a half-time substitute for Marco Reus - darted into the box, knocked the ball around Frankfurt keeper Lukas Hradecky, drawing a foul, and allowed Pierre-Emerick Aubameyang to send the resultant penalty into the centre of the goal. It has been a remarkable campaign for the 18-year-old, who admitted to the Guardian that he could not have imagined featuring this much (Pulisic has made 43 appearances in all competitions) at the start of the season: "I've been lucky, and I’m just thankful that I've been able to stay healthy and the coaches have felt they can trust me to play, whether it’s been off the bench or starting." There can be little doubt, though, that the high point of such a remarkable season – and a remarkable young career – came in Berlin on Saturday night. His live video on Instagram in the aftermath of the victory placed Pulisic at the centre of the celebrations, sharing with his team-mates the satisfaction of, as he put it, "bringing the Pokal back where it belongs." There will no doubt be plenty more such moments.